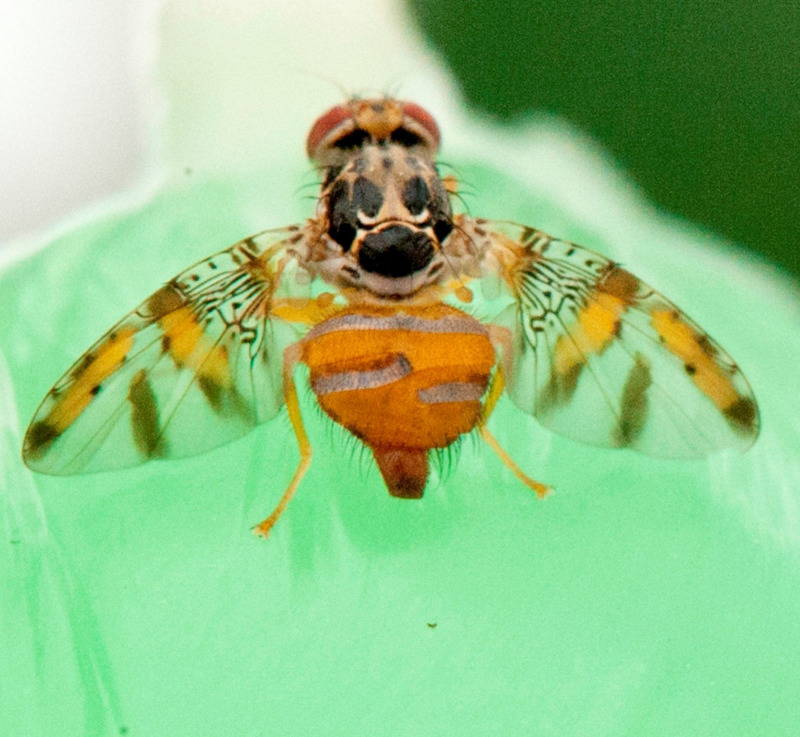 Mediterranean fruit fly (Ceratitis capitata) is a serious horticultural pest in Western Australia. It attacks a range of cultivated fruits and some fruiting vegetables. Medfly, as it is commonly known, has been recorded to infest more than 200 hosts worldwide. The first sign of damage is often larvae-infested or ‘stung’ fruit. Stinging is caused by the female laying eggs into unripened or ripe fruit. Bruising on the outside of ripe fruit can be the first sign of a Medfly larvae infestation. Sometimes the bruise may be around a central hole where the eggs were inserted by the female Medfly. However, fruit that looks perfect on the outside can still be infested with Medfly larvae or eggs, as it can take a few weeks for bruising to appear on the fruit skin. 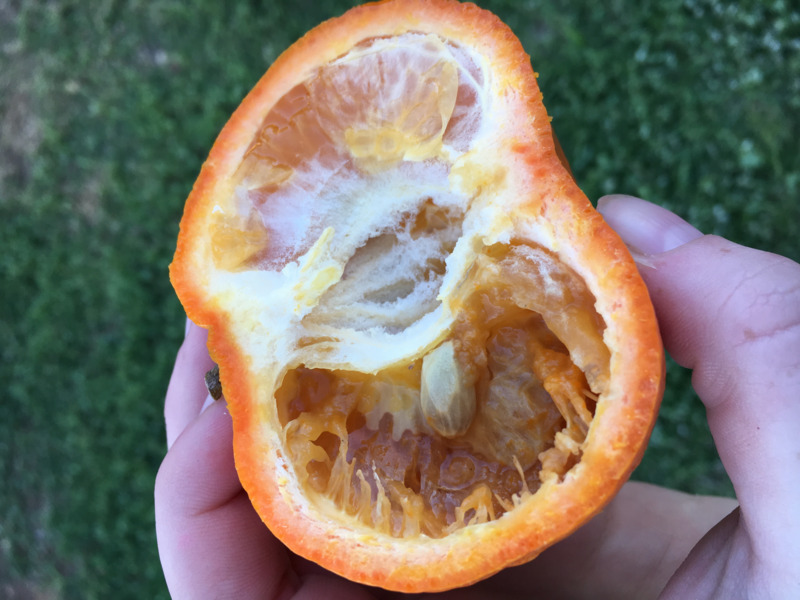 Medfly larvae also damage the inside of the fruit as they eat it, resulting in bruised and broken fruit flesh. Medfly larvae can be found in fruit that is both on the tree or fallen on the ground. Mediterranean fruit fly (Medfly) larvae are most easily seen in the flesh of ripe infested host fruit. Larvae are white with a flat pointed head. 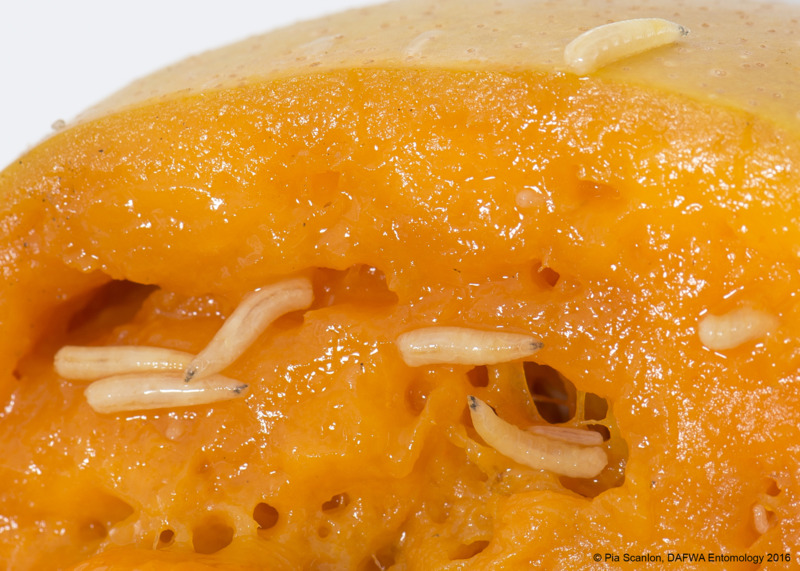 The larvae feed on the fruit, damaging it by causing it to decompose. When Medfly larvae first hatch they are about 1mm long before growing to 8mm and leaving the fruit to pupate in the soil. The adult fly is light brown and 3- 5mm long, slightly smaller than a house fly. The abdomen is encircled by two light-coloured rings and the middle of the fly (thorax) has irregular patches of black and silver, giving it a mosaic appearance. The wings are mottled with distinct brown bands extending to the wing tips. 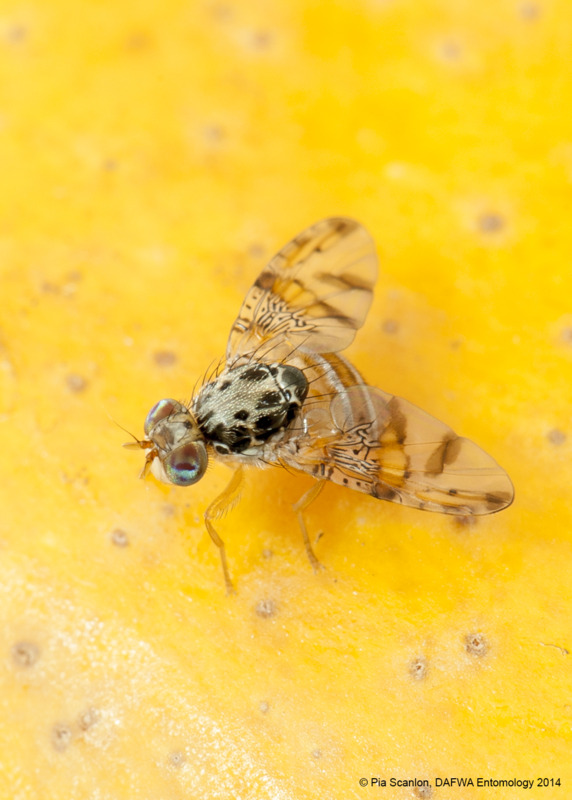 Don't confuse Medfly for Queensland fruit fly (Qfly), which is larger and reddish brown and has clear wings. Refer to the Qfly web pages for more identifying information. The Medfly female has an ovipositor or egg-laying organ but the male does not. Adult Medflies may live for two to three months and are often found in fruit tree foliage, especially citrus trees. As long as fruit is present most Medflies do not move more than 50 metres. However, they will travel further if no hosts are present.